Rendering of aerial view of the planned U.S. Marshals Museum in downtown Fort Smith. A Public Facilities Board that would oversee proceeds from a one-time, nine-month, one-cent sales tax to benefit the U.S. 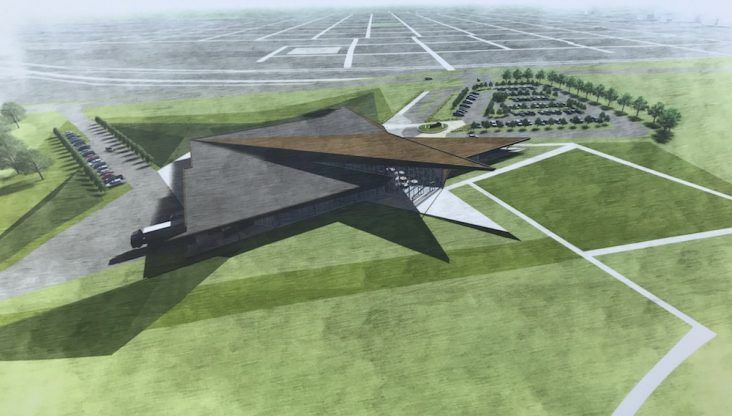 Marshals Museum will not be formed unless citizens approve the tax in a March election. The Fort Smith Board of Directors in December approved an ordinance for a March 12 election. The sales tax will raise the remaining $17 million needed to complete the museum. According to information on the tax, an independent PFB will be created by the Fort Smith mayor with Fort Smith citizens appointed to it by the Fort Smith Board of Directors. This PFB will own the facility and grounds, however, the USMM, not the City, will manage the museum. “The Arkansas Constitution and laws enacted by the Arkansas Legislature require that public funds (proceeds from a Gross Receipts or Sales Tax) be expended for public purposes. In this case, Fort Smith’s Board of Directors will establish an independent PFB, governed by five citizens, who will use Sales Tax receipts from the temporary penny sales tax to purchase the Museum’s building and grounds,” notes the Marshals Museum website. Jim Dunn, president of the U.S. Marshals Museum Foundation, said the foundation would have no objection to the creation of the PFB prior to the election in order to be more transparent. “I think that is a good idea, but really it’s not our call. That is up to the city,” Dunn said. A group formed to oppose the tax has pointed out that voters are being asked to approve the tax without knowing who would serve on the PFB. Fort Smith Mayor George McGill said he wants to better understand the guidelines for forming a PFB, including what they do and what their function is. “I am certain there is guidance on when we should actually form it. I don’t want to rush into anything. I want to make sure it is done correctly. I guarantee, though, that it will be a transparent process,” McGill said. City Administrator Carl Geffken said the PFB will be formed only if the sales tax passes. “The creation of the Public Facilities Board is up to the City, though it must be organized and functioning prior to the receipt of tax collections by the City,” Geffken said after checking with City Attorney Jerry Canfield on the rules and regulations of a PFB. If the tax is approved, it will take effect July 1, and the City will begin receiving tax revenues in August or September. “Given these rules, it only make sense to create the Public Facilities Board between the date of the election and July 1, 2019,” Geffken noted. Once formed, the PFB will lease the building and grounds to the USMM, who will be solely responsible for the operation of the museum, including all operational expenses,” the museum’s site states. This PFB will not be responsible for the museum’s sustainability, Dunn said. Keeping the museum operating will require continued fundraising, said Patrick Weeks, president and CEO of the U.S. Marshals Museum. The museum will need to raise $600,000 a year to add to revenues to keep the museum running, Weeks said. This fundraising will be much easier to accomplish than the trying to raise the significantly greater amount to get the museum built and open, Weeks said. “It’s much more difficult to get very large donations than it is to get the $5,000, $10,000, $20,000 donations that will be needed,” he said. It also will be easier to sign on vendor sponsors and solicit donations once the museum is built and open, showing potential donors what the museum is offering and that visitors are coming to the museum, Dunn added. “It’s a little easier to shake those lower branches,” Dunn said. The museum foundation will work to raise money for an endowment, which then can be used to supplement the operational budget and help defray future capital needs of the museum, Dunn said.